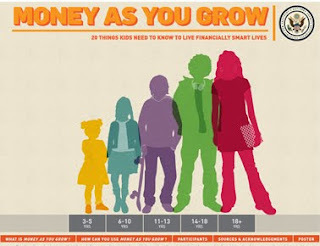 Are your kids smart about money? There's a lot to know about finances. How do you know what to teach your kids at different ages? The financial problems in the United States prompted the creation of the Money as You Grow web site. It's described as providing "20 essential, age-appropriate financial lessons — with corresponding activities — that kids need to know as they grow. Written in down-to-earth language for children and their families, Money as You Grow will help equip kids with the knowledge they need to live fiscally fit lives. The lessons in Money as You Grow are based on more than a year of research, drawn from dozens of standards, curricula, and academic studies." For example, kids ages 6 to 10 should be involved in comparing prices and begin understanding how interest in a savings account works. By the time your child is 14 to 18-years-old, you should discuss how a credit card bill should be paid off every month. One Dad missed this discussion with his daughter and was amazed that she didn't realize she would be charged a huge amount of interest if she didn't pay off the full amount. She was in her early 20's when she learned this expensive lesson. Prepare your kids now to be financially knowledgeable using this helpful site.